Make your kitchen the heart of your home with Dream Doors Leicestershire. Speak to our designers and view our stunning collection at your local kitchen showroom in Loughborough. Dream Doors Leicestershire is your one stop shop for kitchens. Why not visit your local showroom to discuss your ideas with owner Colm and get a feel for our products? At Dream Doors, we supply a whole spectrum of services, from simple door swaps right through to the design and installation of new kitchens. The best place to view our products and designs is your local showroom in Loughborough, where business owner Colm can run you through the options available for your kitchen. All Dream Doors kitchens are made to measure, so you can choose your favourite design and then leave us to figure out how to make it work in your kitchen. We have a wide selection of styles and finishes to match every taste, whether you like modern monochrome or classic country. Dream Doors work closely with our customers to ensure your budget goes as far as possible and that your kitchen design is seamless. A total transformation can be achieved in as little as 2-3 days by putting new doors onto old units or replacing old worktops with new ones to revitalise your kitchen. As all our designs are bespoke, there’s no need to worry about awkward angles or difficult corners – we will find the best way to make the chosen design work in your kitchen. Our highly personalised service is overseen by business owner Colm, so you can have total confidence that you will be kept informed throughout the process and satisfied with the end results. A kitchen makeover is a win-win. Less cost, less waste, less time and hassle but that fresh brand new kitchen feeling is still achieved. At Dream Doors, we also cater for large scale kitchen refits and can supply the kitchen cabinets, worktops, sinks and flooring. We also offer a range of kitchen appliances, from ovens and hobs to fridges and freezers; you can choose from a range of appliances from reputable brands to finish off your dream kitchen in style. With our bespoke made to measure service, you can rest assured we will deliver a stunning new kitchen that fits seamlessly in your home. We appreciate that designing a new kitchen can be quite daunting. This is why, as well as inviting customers to visit our showrooms to speak with our design experts and get a feel for the quality of our kitchens, we can also visit you at home. Book an appointment with Colm, who will measure up your kitchen space and provide a free quote, based on your style preferences, with absolutely no obligation to buy. 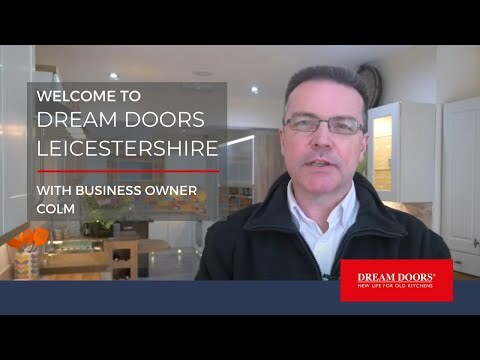 Dream Doors Leicestershire is ideally placed for residents living in local postcode areas: LE1, LE2, LE3, LE4, LE5, LE6, LE7, LE8, LE9, LE10, LE11, LE12, LE16, LE17, LE18, LE19, LE65, LE67 including Thurmaston, Barkby, Thurnby, Oadby, Wigston, Oadby & Wigston District, Great Glen, Newton Harcourt, Harborough District, Market Harborough, Kibworth, Fleckney, Smeeton Westerby, Houghton On The Hill, Cold Newton, Hungarton, Beeby, Evington, Scraptoft, Kibworth Harcourt, Hinckley, Barlestone, Markfield, Newtown Linford, Leicester, Loughborough, Shepshed, Ibstock, Groby, Anstey, Coalville, Ashby De La Zouch, Countesthorpe, Bruntingthorpe, Broughton Astley, Cosby, Blaby, Glen Parva, Blaby District, Whetstone, Enderby, Braunstone, Glenfield, Groby, Ratby, Kirby Muxloe, Leicester Forest East, Narborough, Desford, Botcheston, Thurlaston, Huncote, Sapcote, Sharnford, Stoney Stanton, Croft, Thornton, Newbold Verdon, Burbage, East Leake, Rothley, Lutterworth and surrounding Leicester local UK areas. "Excellent services and workmanship like a complete new kitchen"
"Very good. Excellent finish. Kept to the time schedule. Tidied up every night."